I've left the picture large enough for you to click on it and enjoy the view :) She has not used any fancy threads - just simple cotton strands. But the color selection is perfect, don't you think? The stitches used are the every day ones - stem stitch and blanket stitch . Do click on the pic for the close up view. I love the way those lines curl.So natural. Lovely work, Mahalakshmi . oh my goodness, simply marvelous. That is such beautiful work, Mahalakshmi! Thanks for showing it to us, Deepa. It's beautiful, amazing!Congratulations and thanks for sharing, Mahalakshmi! Things that make you go OOOOOHHHHHH! Lovely work Mahalakshmi and all the more beautiful because of it's simplicity. awesome,.........perfect....i got no words to describe, it looks just superb. that looks so real.. i thought its an original feather placed there.. wow!! looks so real. fantastic work.i too had done similar work on a blouse used for 'langa-blouse'. i gifted it. but the sad thing is i don't have picture to prove my point. next time when i happen to go to their place, i surely try to find that piece and take a picture. So real..very smart way of using colours...i like it..
Tahnk u Deepa she proved with cotton threads only one can make wonders.. This has already been published on 2009.03.31. My own design! What's your girlfriend's blog? Thanks for the link.Saw the peacock feather stitched by you. Good work!! My friend does not have a blog. 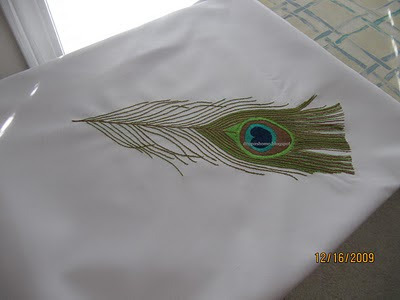 Hi Deepa.. Beautiful embroidery of a peacock feather, it does look so real and the colors does it justice for sure. For New Year I wish for you, good heath,joy, happiness and all the good things the New Year can bring to you and family. It looks like a real feather. So beautifully done. Really appreciate the talent, the intricancy.